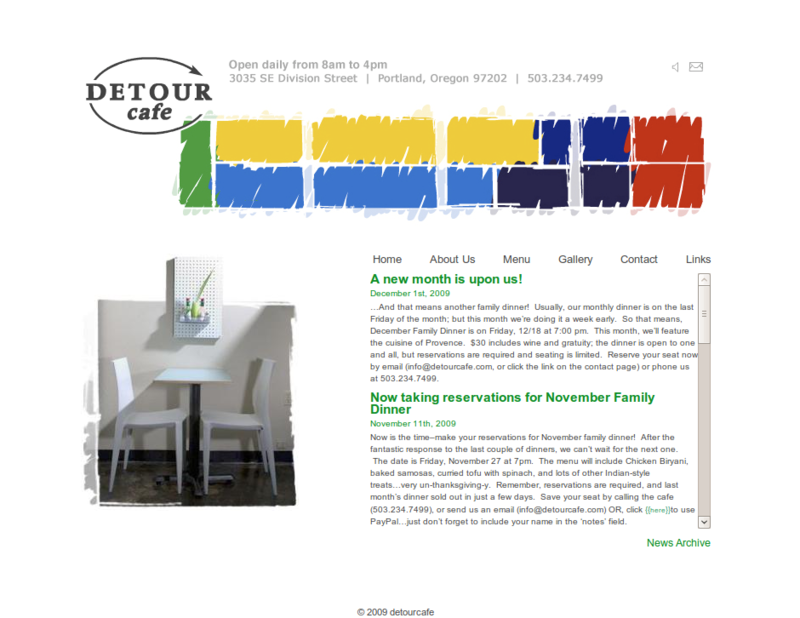 Detour Cafe is a fabulous (I recommend The Boys Upstairs which is a sandwich featuring Italian sausage with roasted onions, melted mozzarella and tomato sauce) cafe in South East Portland that I had the honor of collaborating once again with Emily Steen from Built Studios on for their website. They already had a basic site, but it was slow and hard to update (since it relied on a lot of flash). Emily designed a few enhancements to the sites usability and I rebuilt the site from scratch to use WordPress to allow them to make all the changes to update the site easily and often. I provided all the coding outside of the site header and trained Becky, one of the Cafe owners, on how to use WordPress.